We have some great golf packages for the Dona Julia Golf Course with accommodation in the near by by EL Goleto Apartments. Treat yourself to a wonderful break on the fantastic Costa Del Sol. Pueblo El Goleto is a touristic complex inaugurated in August 2007 built in the typical Andalucian village style, situated 1 km from the Castillo beach, on the coast of the municipality of Manilva. The hotel apartments Pueblo El Goleto is constructed on a old vineyard and it’s composed of 7 low rise apartments blocks distributed between ground floor & two floors more. The complex is situated in what is known as the Valley of Golf, filled with peacefulness and offering all the services of a modern apart hotel. Its design and horizontal construction is inspired in the typical andalucian Whitewashed villages and its decoration and equipment are of the highest standard in accordance with its category. – Apartments of 1, 2 and 3 bedrooms and 2 bedrooms penthouses. All the 2 and 3 bedrooms apartments dispose of two bathrooms as do all the penthouses. – Gymnasium zone and small Spa equipped with a Jacuzzi, Sauna, Turkish bath and aromatic bath . – Lifts giving direct access to the underground parking. – Adult swimming pool, gardened areas, fountains, patios and beautifully planted corners. – Gymnasium, Spa, parking space, internet Wi-Fi and safe FREE OF CHARGE. – At check-in, a deposit of EUR60,– has to be paid in order to cover for any eventual damages. This deposit will be reimbursed on check-out. Located in a strategic location on the Costa del Sol, Doña Julia Golf course is managed by the THEUD GROUP, which is perfectly integrated into the natural landscape of the area and is noted for its magnificent views over the Mediterranean Sea. 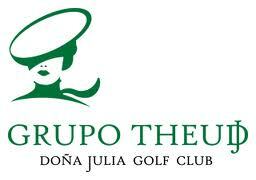 Situated in a Strategic location of the Costa del Sol, “Doña Julia” is a Golf Course managed by the “THEUD GROUP”, which is perfectly integrated in a natural environment set in an area offering magnificent views of the Mediterranean Sea and the Coast of North Africa. It has been designed by prominent Architect from Malaga Antonio Garcia Garrido. The outstanding characteristics of this Course are the greatness of extent of its Greens, planted with Agrostis Pen – G2, with an average of 700 m2 and some measuring even more than 1000 m2. The Course entails two varied rounds suitable for all types of players. The environmental respect, the quality of elements implemented in its construction, the amplitude of the greens and the panoramic sea and mountain views, make Doña Julia a spectacular course to enjoy Golf. The following are some lead in packages, call us today for an exact quotation.